The activities of RISC Software GmbH, a subsidiary of Johannes Kepler University Linz and Upper Austrian Research GmbH, focus on the development of complex software solutions for industry and science. Our clients are industry-specific market leaders and international corporations with whom we have successfully realized a large number of projects over the past 20 years. We were able to establish ourselves as national and international R & D partners for demanding and innovative software developments. Our solutions focus on the areas of Logistics Informatics, Advanced Computing Technologies and Medical Informatics. Technological progress and a wide variety of challenges allow our employees to immerse themselves in future-oriented areas and thus constantly expand or deepen their knowledge. Direct customer contact is an important part of our daily work. The solutions developed bear the hallmarks of the respective employees and are therefore directly involved in customer success. Our employees are given the opportunity to continue their education. Some employees use this offer and study at the university or attend continuing education courses. Mutual support and teamwork are key factors in our success. Due to our size, the decision-making processes are short and allow rapid transfer of responsibility. Whether fresh from the University of Applied Sciences / University or already experienced by the profession – all age groups and several nationalities are represented here. 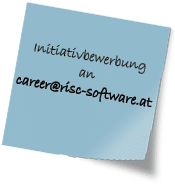 You did not find any suitable job, but you are interested in joining RISC Software GmbH?